Brought forth by MSH - the makers of the 'Brain' - the iKon represents a new leap in flybarless control. Bert Kammerer, in cooperation with MSH, worked tirelessly to fine tune the iKon flybarless controller to perfection. Every aspect of firmware has been fine-tuned and optimized, and in the end, we can say this system simply has no equal on the market today. The iKon is ready to change everything. Get ready for the iKon - it's ready for you. Simply put, gyros hate vibration, and when a flybarless system is sensitive to vibration, this has a direct impact on flight performance. The iKon flybarless unit utilizes new vibration dampening technology to isolate vibrations and put them in their place. This results in rock solid flight with nothing but true, direct flight performance that you can see and feel. Nothing is more irritating, frustrating and time consuming than fumbling with manuals, setup videos and tech help when it comes to proper flybarless setup. No more - the wizard takes control. Utilizing an easy to follow and fuss free setup, the iKon takes a simplified approach to flybarless setup, allowing you to spend less time tuning and more time flying - just the way it should be. That sickening crash can now be put behind you with auto level technology. For anyone still learning the basics, or those pushing new 3D limits, the auto level technology built within the iKon will revolutionize the way you fly, allowing you to push the limits with less risk of crashing. This technology is one of the multiple reasons that make the iKon so special, allowing a recovery from any orientation, no matter if the aircraft is right side up or upside down. Unlike other "bail out" technologies, the iKon "knows" how the aircraft is orientated, allowing a right side up recover every single time. Further, with auto level technology, the aircraft will remain level, allowing those first few training flights to be truly memorable - in a good way. 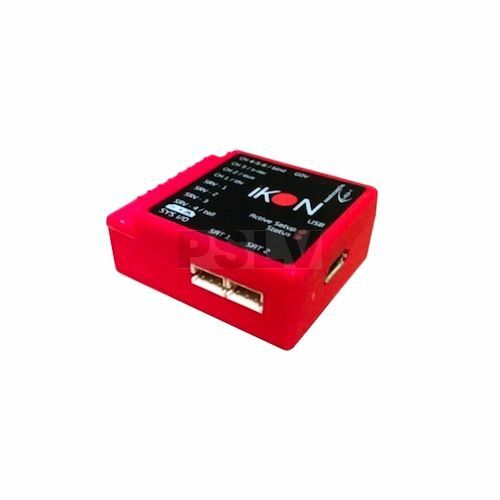 Allowing the convenience of satellite technology, the iKon supports Spektrum DSM2 & DSMX satellite receivers, along with S-Bus technology via Futaba. On the Spektrum side, (2) satellite ports are offered for maximum redundancy & path diversity, suited for helicopters 500 sized and greater. Utilizing a transmitter selectable governor, the iKon brings compact flybarless technology to every level of the helicopter, allowing you to dial in that perfect rotor speed that suits your style, all at the flip of a switch. Incorporating a selectable (3) switch flight mode program, the iKon allows you to dial in your helicopter with fully adjustable flight mode parameters to obtain the very best from every flight. No more ancillary devices needed on your machine - the iKon handles it all.